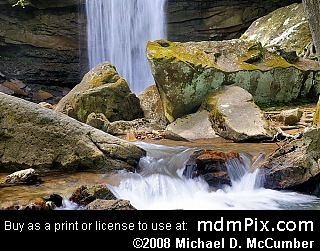 I wanted to photograph many of Ohiopyle State Park, Pennsylvania's features with spring foliage. Intervals of strong gusty winds did give me some hesitation about visiting the park today as winds tend to blur forested scenes. The atmosphere included haze and some fast moving clouds with occasional clear skies. I didn't plan any major hikes today as I just really wanted to skim the park and get a nice variation of spring pictures. I arrived about noon and of course made my first stop at Ohiopyle State Park, Pennsylvania's day use area that includes observation decks for viewing the Ohiopyle Falls. Upon arrival I could see mists rising high above the falls, which predicted as I feared that the water level of the Youghiogheny River was too high and thus the well defined waterfall would be a white wall of froth from shore to shore with little definition, which it was. While I snapped some pictures of the angry Ohiopyle Falls, I knew I wouldn't use any of them and the time of day (noon) didn't help matters. The lower observation deck was wet with mist from the Ohiopyle Falls. Near the falls the park erected a raised garden bed to exhibit the unique plant species (to Pennsylvania) found in the park that are washed down river from more warmer southern states. There I found some mushrooms that I photographed before following the river's shore line north. The Youghiogheny River was exceedingly rough today white enormous rapids gushing over what later in the summer will be exposed rocks. I took several pictures of the river along with the fresh green forest over on Ferncliff Peninsula as I walked toward the bridge for the Youghiogheny River Trail and Ohiopyle. My next stop was the Cucumber Picnic Area, which I figured would be a nice area to eat my lunch. It's a good ways away from the main roads and I figured the forest and Cucumber Run would be a nice leisurely place to relax after a long drive. It was. Birds, the sound of water, and the rustic peacefulness of the place made my sandwich taste better than it otherwise would have. I liked a one lane bridge and snapped a picture of it and the sign marking the picnic area before heading on down stream to Cucumber Falls. The near noon light would ensure the waterfall would be well lit as it tumbles into the dark Cucumber Run ravine. I parked my car and walked down the path to the high observation point for Cucumber Falls, where I found a boisterous wall of white water with an almost black background as the ravine walls were in dark shade. Fearing the contrast would make the picture unusable; I climbed over the fence and headed towards Cucumber Falls' precipice where I took a couple pictures with an emphasis on the waterfall's starting point. Unfortunately, a large tree branch that must have washed downstream during the winter made a few of those pictures appear busier than I would have liked. I backtracked back to the observation point and walked down the natural stairs into the deep ravine that was filled with a cold refreshing mist from the waterfall and walked towards it over a natural mound and some large rocks and snapped some more pictures I figured I wouldn't use for the contrast of brightness verse darkness was too much to make a compelling picture. Additionally, the waterfall was considerably larger than normal taking much of its usual definition away. I found a small fern jetting out a rock and photographed that before heading back to the stairs and walking down to the river. I arrived at the mouth of Cucumber Run with the discovery that the Youghiogheny River had swallowed up some of my favorite rocks to take pictures from of Laurel Ridge and the gorge, thus I had to climb around some thick vegetation in an attempt to get the same perspectives. I took a few photographs looking downstream that featured impressively tall white pine trees on Ferncliff Peninsula. I also took one up stream but it was difficult to take a wide shot with all of the plants surrounding me. Some butterflies were fluttering all over the place, but I wasn't able to get any close ups of them as they mostly rested on the sandy soil that forms a beach like quality here. I followed Meadow Run Trail a short ways to get to some large rocks along the river and took a few more pictures before heading back towards Cucumber Falls. About 30 years downstream of the falls, I made an attempt to cross the rock boulders and logs along the ravine floor without getting wet in an attempt to get to the other side for some shots of the falls. About halfway across, two large rocks with an opening right before the waterfall's bottom caught my eye. I took several pictures that just concentrated on that point along with a rapid below it. After I photographed them I came to a log that made passing the brunt of the stream possible. After some careful maneuvering I made it across and climbed up to the dripping walls of the ravine and took some pictures there I figured wouldn't be usable given the contrast of bright water and dark walls behind it. I then began heading away from the falls now on the opposite shore and caught a glimpse of a window leading out of the ravine and snapped some pictures of it before following it out. I went around the cliff formation and headed down towards the river where enormous piles of mulched branches had been deposited near the shore that made walking between large rocks possible. I got to the edge of some rapids and took some pictures there before heading back to the unnamed trail and following it out towards the Great Gorge Trail. Walking up a hill near some Blue Limestone Rocks I noticed Wild Geranium were all along the trail. I photographed them and some vertical cones of small flowers (that I haven't identified yet) before heading up the hill where I discovered the Great Gorge Trail that I followed to return to the car. It was early afternoon now and I drove up the steep road towards the Tharp Knob Overlook where I discovered the park had recently mowed the vegetation below it completely down offering the best view I had seen there in quite sometime leaving only the hazy conditions a problem to be dealt with. The Youghiogheny gorge was photographed with spring foliage from many different angles and perspectives before I noticed some Cherry Tree blossoms that I also photographed. The sweet aroma of them and other flowering plants was very inviting at the beginning of Kentuck Trail. In hindsight I should have followed that trail for it contains a lot of shrubs and open meadows along it that would have featured plenty of spring blossoms. Instead I left the area for the Meadow Run Natural Waterslides where I found Meadow Run to also be overflowing its banks. At this point most of the sky turned cloudy and that was well welcomed as it would level some of harsh contrast between the stream and its dark cavernous shoreline rocks and Rhododendrons. I took photographs of the large ribbed rocks along Meadow Run while I walked down to the bottom of the natural waterslides to get a perspective looking up at the popular feature. The channel of water that is used to slide down is spilling over to flood the stone banks, and I found the white frothy water difficult to expose properly while including the dark shoreline. For each picture I took two shots, one exposed for the water and the other for the shoreline and later merged them together into one picture. I then followed Meadow Run Trail towards the Youghiogheny River where (as I guessed) most of the rock lined shore was now completely under water as rapids instead. Following what was left of the trail I came to a spot where I photographed a waterfall that is normally dry along with Ferncliff Peninsula as a back drop. I took some photographs of the river and the gorge wall before heading back to the Meadow Run Natural Waterslides. I took a few more pictures of Meadow Run before finally heading on home. shareShare this Page "mdmPix.com: May 10, 2009"